A major earthquake off the northern coast of Papua - New Guinea (PNG) generated one of the most destructive tsunamis to strike this country in recent years. There was no warning. The tsunami killed thousands of people and left more than 6,000 people homeless. Many more were missing. As of July 20, 1998, almost 5,300 of more than 10,000 people who lived in the devastated villages had been accounted for, with 3,370 survivors at three government relief centres, 713 admitted to hospitals and 1,212 buried. As of August 15, 1998, the death toll had risen to more than 3,000. The final death toll may never be known with certainty. The earthquake occurred approximately 45 miles (70 km) Southeast of Vanimo, New Guinea, PNG, at 08:49 GMT on July 17, 1998 (6:49 PM local time in Papua New Guinea). According to the National Earthquake Information Service (NEIS) of the U. S. Geological Survey, the epicenter was 3.08 S, 141.76 E (about 12 miles offshore). The depth of focus was less than 33 km and the magnitude was 7.1. A major aftershock followed, less than an hour later. Review of source mechanism studies of previous shallow focus earthquakes in this region display a variety of faulting mechanisms. However, most of the previous earthquake events near the vicinity of the July 17, 1998 event, are along steep dipping reverse faults. Source Mechanism studies of earthquake events east and south of the July 17, 1998 area, display mostly strike-slip movements. However, to the west the source mechanisms of earthquakes show mostly normal faulting. Finally, there is a great deal of similarity in the mechanism of the 17 July, 1998 earthquake and that which occured on 14 May 1982. In the vicinity of the July 17, 1998 event, earthquake movements occur along steep dipping reverse faults. Tsunami effects focusing and orientation - as described below - indicate an earthquake generation mechanism involving reversee faulting at least along a localized fracture approximateley 30 km long. Dr. Ma wrote: "My results have some differences with that of others but have some similarities with the figure that you drew. The isotropic part of the moment tensor is less than zero. If this result is true, compress effects may be exist near source". Tensor Analysis - See also tsunami source mechanism described below. 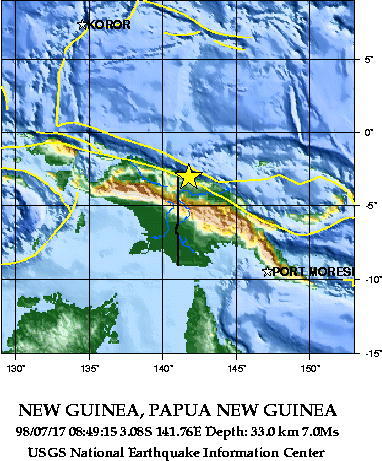 The northen coast off Papua New Guinea,along the Bismarck Sea where this earthquake occurred, is is a very active seismic region involving complex interactions and movements of tectonic plates. This is an area where the smaller Caroline tectonic plate subtrusts the larger Australian tectonic plate. Most of the earthquakes along this zone result from strike slip movements but some occur along steep dipping reverse faults with vertical components sizable enough to generate destructive local tsunamis. The earthquake of 17 July, 1998, generated a local destructive tsunami. Large tsunami waves destroyed primarily three fishing villages along a 30 km stretch of beach west of Atape, in the West Sepik Province of Papua New Guienea (PNG). Most of the deaths occurred at the villages on the shores of the Sissano lagoon area (see Photo below). Minutes after the earthquake shook the region, three successive tsunami waves battered the coastal villages causing chaos in the darkness of the early night. Two of the villages, one on the spit separating the sea from Sissano lagoon, were completely swept away. At the Warapu, a village of 1,800 people, and at Arop, a village of 1800-2,000 people, there were no houses standing. Palm and coconut trees were ripped out completely by the wave action. Tsunami Effects: The villages on the slender spit of land which separates the Sissano lagoon from the sea completely disappeared. A priest's house was picked up and swept 200 meters (600 feet) inland. Paul Saroya, a survivor who lost eight members of his family commented: "We just saw the sea rise up and it came toward the village and we had to run for our lives"
Based on seismic and reported tsunami wave data, on review of source mechanism studies of previous shallow focus earthquakes in this region, the following observations can be made about the source mechanism of this tsunami. 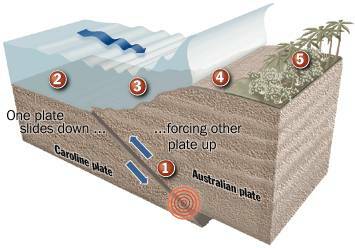 Tectonic Source Motions: The mechanism of tsunami generation was primarily the result of subthrusting of the Caroline tectonic plate underneath the Australian plate. As described above, most of the historical earthquakes in the area display a variety of faulting mechanisms but mainly are of the strike-slip or normal faulting variety. However, in the vicinity of the July 17, 1998 event, earthquake movements occur along steep dipping reverse faults. Recently Dr. Shutian Ma of the National Resources, Ottawa, Canada (personal communnication- Oct 99) estimated the focal mechanism of the 1998-07-17 Papua New Guinea quake and found similarities wich support the proposed earthquake and tsunami source mechanism. According to Dr. Ma the isotropic part of the moment tensor is less than zero. If this result is true, compress effects may exist near the source. Such compress effects would indeed cause steeper dipping reverse faulting resulting in a localized tsunami of greater height - in this case, for approximately 30 km. Because of the localized destructiveness of the July 17, 1998 PNG tsunami and the fact that most of its effects were concentrated along only a 30 km portion of the coast line, we must conclude that the tsunami had a relatively small generating area. This generating area can be approximated by an ellipsoid approximately 30 to 35 km long and perhaps as much as 15 km wide, with its major axis approximately paralleling the 30 km stretch of beach west of Atape in the West Sepik Province of PNG (see agreement above with tensor analysis results by Dr. Ma). Based on these approximations, the total tsunami generating area is estimated at less than 400 square kilometers. The absence of extensive damage elsewhere, supports this estimate. Average vertical displacement of the ocean floor is estimated to be in the order of about 2 meters. The total volume of displaced material is estimated at approximately 7-8 cubic kms - indeed a very small amount for Pacific-wide tsuanmi generation. However, the preliminary estimate given here, does not include the volume of sediments which may have been moved as a result of underwater landslides. Also, it remains to be established to what degree such underwater landslides of loose sediments may have contributed to the destructiveness of the tsunami. Finally, the energy of the earthquake and that which went into tsunami generation, remains to be calculated. The tsunami-affected region was well within the tsunami generating region, which accounts for the short travel time and the short period of the destructive waves. As reported by survivors, travel time for the first destructive wave was approximately one minute. A total of four waves were observed all within an 18 minute time span, which means that the period of the tsunami waves was extremely short, averaging about 4 minutes. The short period may be indicative of the deeper water depth in the offshore area. Bathymetric charts show such deep water which could account for the shorter periods, considering also the small size of the generating area. Also, the bathymetric data indicates a sharp slope gradient where underwater landlsides may have been generated, which may have contributed to the destructiveness of the sea waves. It is not known to what extent slumping and underwater slides contributed to tsuanmi generation. The bathymetry and the process of sedimentation in the area must be studied. Slumping and landslides may very well be part of the source mechanism that contributed to the destructive waves, as was the case with the 1946 Alaska tsunami. Sediment slumping made the 1946 tsunami much more destructive than what it would have been otherwise. The geology of Sissano Lagoon and the spit in front of it, suggest extensive sedimentation which must extend into the sea. There is evidence that the offshore slope in the vicinity of Aitape has a steep gradient which could have contributed to the extreme height of the tsunami. This view is shared by the Tsunami Laboratory of the Russian Academy of Sciences which provides a map of the bathymetry just offshore of the northern coast of New Guinea, commenting on this very steep slope. The spit in front of Sissano Lagoon where the fishing villages were situated, is an area very similar to San Juan island, a spit in the state of Narino, in Colombia , where a similar catastrophic tsunami occurred in 1979, killing many people. In Colombia, the situation was very similar to PNG - fishing villages were situated on low-lying coastal areas. The tsunami effects at San Juan island were very similar to those of Aitape in PNG. There was also a lagoon on the other side of a San Juan Island - an elongated coastal spit. The tsunami travel time of the 1979 tsunami in Colombia was a little longer, so there was opportunity for evacuation. However, same as in Sissano Lagoon, there was no safe area to evacuate to. As in Sissano, maximum land elevation was about 3 meters, and there was no higher ground to escape. The tsunami in Colombia was only 3 meters, but many lives were lost at San Juan and at Charco. If refuge platforms had been built for vertical evacuation, many lives would have been saved. The death toll would not have been as high for this 1979 Colombian tsunami, nor for the Moro Gulf tsunami in the Phillipines, which in 1976 killed more than 10,000 people. Preparedness, a program of public education on the tsunami hazards, and Refuge Platforms for vertical evacuation may be the most effective way in saving lives in PNG for similar coastal areas, when the next tsunami disaster strikes. Abers, G., and R. McCaffrey, 1988. Active deformation in the New Guinea fold-and-thrust belt: Seismological evidence for strike-slip faulting and basement-involved thrusting, J. Geophys. Res., v. 93, p. 13,332-13,354. Everingham, I.B., 1974. 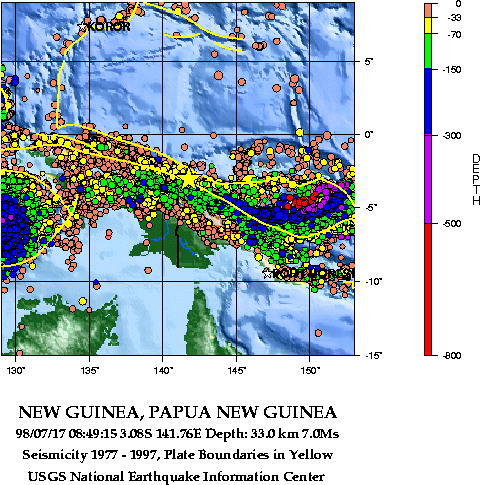 Large earthquakes in the New Guinea-Solomon Islands area, 1873-1972, Tectonophysics, v. 23, p. 322-338. Geist, E. L., 1998. Local tsunamis and earthquake source parameters, Advances in Geophysics, v. 39, p. 117-209. Pararas-Carayannis, George. Five Year Plan for The Development of A Regional Warning System in the Southwest Pacific. A Report prepared to the United Nations Development Program (UNDP), New York, May 1989, 21 p.
Pararas-Carayannis, George, Survey of Philippine Earthquake and Tsunami of August 16. 1976, ITIC Report 1976. "Severe Earthquake and Tsunami Hit the Philippines, August 16, 1976. Abstracted article, Tsunami Newsletter , Vol. IX, No. 3, September, 1976. Pararas-Carayannis, George. International Tsunami Information Center A Progress Report For 1974-1976. International Coordination Group for the Tsunami Warning System in the Pacific, Vina Del Mar, Chile, 1977. Pararas-Carayannis, George, Indonesian Earthquake and Tsunami of August 19, 1977, Intern. Tsunami Information Center Report, Abstracted article in Tsunami Newsletter, Vol. X, No. 3, September, 1977. 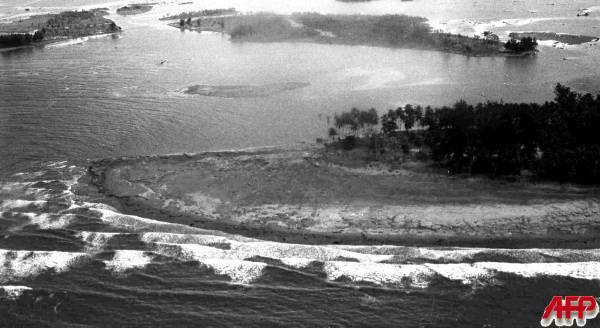 Pararas-Carayannis, George, Survey of the Earthquake and Tsunami of December 12, 1979, in Colombia. Intern. Tsunami Information Center Report, Abstracted article in Tsunami Newsletter, Vol. XIII, No. 1, January, 1980. Smith, W. H. F., and Sandwell, D. T., Science, v. 277, p. 1956. Additional documentation of the July 17, 1998 Papua New Guinea Tsunami can be found at the following web sites. Now available from Amazon, Barnes and Noble and other major bookstores. A signed by the author copy can be also ordered by contacting directly by email Aston Forbes Press. (©) Copyright 1963-2007 George Pararas-Carayannis / all rights reserved / Information on this site is for viewing and personal information only - protected by copyright. Any unauthorized use or reproduction of material from this site without written permission is prohibited. Template Courtesy of "Budget Office & Facility Supply"